Before you press fruit you should pulp it. The pulpmaster is a stainless steel blade on a spindle, which sits centrally through the bin lid which acts as a guide and shield. 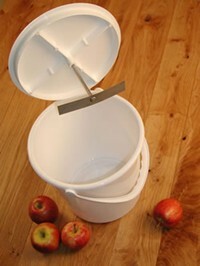 Place fruit or veg in bin, then attach spindle to drill, place lid on bin, switch on and move up and down through the lid to pulp. Comes complete with a food grade bin.